The skin is the first line of defense for the body, providing protection against toxins, microorganisms, and chemicals in the environment. Thus, the loss of skin integrity can result in substantial physiologic imbalance and significant disability or death. The prevalence of chronic wounds associated with the loss of skin is an important concern within the health care field.1 It is estimated that approximately seven million patients have some form of chronic wounds/ulcers that are associated with diabetes or pressure.2–4 The health care cost for chronic wounds is estimated to be as high as $20 billion annually in the United States.5–8 The current standard of care for chronic wounds consists of debridement, irrigation, moisture retentive bandages, and antimicrobial therapy. These treatment paradigms are aimed at promoting wound healing and the restoration of homeostasis. Normal flora can easily colonize wounds and lead to wound infections, as reported by a recent clinical study examining the evolution of the microflora in burn wound infections.20 In this study, 33% of patients’ wounds were already colonized upon admission. About 50% of these burn wounds were found to be colonized by S. aureus, while the other 50% harbored Gram-negative organisms such as P. aeruginosa, as well as Acinetobacter, Klebsiella, and Enterobacter spp., and Escherichia coli.20 However, as this study was conducted using standard culturing techniques (serial dilutions, and culturing on nutrient-rich agar plates), nonculturable microorganisms were not considered. In contrast, utilizing a variety of molecular techniques (pyrosequencing, denaturing gradient gel electrophoresis, and full ribosome shotgun sequencing), the Wolcott laboratory reported the microbial populations from 30 patients with different types of chronic wound infections.21 Regardless of the type of wound (diabetic, pressure, or vascular), the most common genera found were Staphylococcus, Pseudomonas, Peptoniphilus, Enterobacter, Stenotrophomonas, Finegoldia, and Serratia spp.21 Strict and facultative anaerobic bacteria were shown to make up the majority of the microbial population (around 80%) in the wounds, but ratios of strict/facultative anaerobes differed based on the wound type: diabetic (25%/65%); pressure (58%/25%); and venous (5%/75%). With high-throughput sequencing techniques becoming cheaper and more accessible to health care providers, a whole host of new microbes are now becoming associated with disease. Undoubtedly, large amounts of new information will be generated concerning which microbes are harmful, beneficial, and/or neutral in the chronic wound. Meanwhile, the purpose of this review is to examine recent evidence concerning the deleterious interactions between bacteria and wound tissue, discuss the possibility of using beneficial bacteria to treat wound infections, and consider the translational potential of current studies to optimize future wound management approaches. Bacterial biofilms are thought to delay wound healing for a variety of reasons, namely by shifting the wound immune response toward chronic inflammation (Figure 1). In theory, as long as the biofilm is present, the immune system will try to remove it, resulting in prolonged inflammation with collateral damage to the host tissue.22 The host immune response is a complex multifaceted system that has been divided into the adaptive and innate immune systems. The innate immune response is made up of the skin barrier, commensal bacteria, the complement system, and both phagocytic (eg, macrophages and neutrophils) and nonphagocytic (eg, natural killer cells) leukocytes. The innate immune system recognizes a broad group of molecules specific to microbes such as lipopolysaccharide, peptidoglycan, and lipoteichoic acid via pattern recognition receptors, and is critical in fighting off bacterial infections and mounting the initial immune response to invading microbes.23 Once the epithelial skin barrier is compromised, the microbial skin flora are typically the first to contaminate, colonize, and potentially infect the wound. Tissue macrophages and other cells respond to these invading bacteria by releasing cytokines and chemokines, which stimulate polymorphonuclear neutrophil (PMN) chemotaxis to the wound site. One to 2 days later, macrophages migrate to the wound site to phagocytose bacterial cells, and for efferocytosis, which refers to the engulfment of apoptotic cells. Dendritic cells and macrophages then present antigens to the correct T-cells, which begins the cascade for subsequent antibody production.24 However, pathogenic bacteria have evolved numerous methods to evade the immune response in wound infections, which the following section will expound upon. Figure 1 Deleterious actions of biofilms in chronic wounds. Notes: Bacterial biofilms are thought to delay wound healing for a variety of reasons, including reducing local oxygen levels, mechanically inhibiting granulation, increasing tolerance to antimicrobials, and shifting the immune response toward chronic inflammation. Interactions between bacterial biofilms and dying or ineffective neutrophils and macrophages appear to significantly contribute to the chronic inflammatory state seen in chronic wound infections. Abbreviations: EPS, extracellular polymeric substance; PMN, polymorphonuclear neutrophil; NET, neutrophil extracellular trap; 3-oxo-C12-HSL, N-3-oxo-doedecanoyl-L-homoserine lactone. Further evidence of the deleterious interactions between biofilms and PMNs came from Nguyen et al,40 who utilized a type 2 diabetic murine wound infection model to show that the presence of S. aureus biofilms significantly reduced neutrophil oxidative activity, leading to higher bacterial load and decreased healing rates. While S. aureus induces NETosis in PMNs, it was recently shown that S. aureus is able to degrade NETs to deoxyadenosine, triggering the caspase-3-mediated cell death of immune cells.41 In addition, clinical staphylococcal infections seem to be correlated to reduced neutrophil apoptosis in diabetic patients, which leads to prolonged tumor necrosis factor-α production and reduced neutrophil clearance.42 In summary, PMNs are effective at killing planktonic cells,43 but biofilms appear to resist the bactericidal effects of PMNs, and may even benefit from the cellular debris left in their wake. It is clear from these recent studies that interactions between bacterial biofilms and dying or ineffective neutrophils contribute strongly to the chronic inflammatory state seen in chronic wound infections. Following the migration of PMNs to the site of injury, another innate immune cell population arrives: the macrophages. Macrophages arrive 2–3 days following tissue damage to challenge any microbial invaders, which the PMNs have not eradicated. Macrophages also phagocytize apoptotic/necrotic cells in a process called efferocytosis.44 Macrophages kill bacterial cells by phagocytosis followed by the production of ROS, but the interactions of macrophages with biofilms are less well characterized than those of PMNs. In 2003, it was observed that N-(3-oxododecanoyl)-l-homoserine lactone (3-oxo-C12-HSL), a quorum-sensing molecule produced by P. aeruginosa, induced apoptosis in macrophages.45 However, 3-oxo-C12-HSL has also been shown to activate phagocytosis, while not affecting ROS production.46 When biofilms were incubated with macrophages in vitro, those lacking alginate were eradicated by macrophages in 4 hours. The killing of these biofilm cells was mediated through phagocytosis, and was dependent on the presence of interferon-γ.47 S. aureus has been shown to reduce macrophage numbers by releasing nuclease and adenosine, which degrade NETs and exclude macrophages from abscesses.41 Based upon the literature, P. aeruginosa biofilms seem less protected from macrophages, though there are various mechanisms that P. aeruginosa and S. aureus employ to diminish their effectiveness. Figure 2 The importance of managing pH in chronic wound infections. Notes: The acidic pH of the skin is one of the key mechanisms that protect it from microbial infections. In wounds, increasingly alkaline pH is a predictor that they will become nonhealing or chronic. However, wounds that are too acidic are less likely to successfully accept grafts. The activities of most biological and enzymatic therapies have pH optimums, and numerous factors can shift wound pH including debridement and bacterial colonization. There are numerous factors that shift the wound toward an alkaline pH, including lowered oxygen tension, stage of healing, debridement, maggot therapy, and bacterial colonization (Figure 2).54 For example, Proteus mirabilis, Klebsiella spp., and P. aeruginosa produce urease, an enzyme that catalyzes the formation of ammonia from urea. The release of alkaline ammonia promotes bacterial attachment and growth, as many wound pathogens require neutral to alkaline pH environments to form biofilms.57 Additionally, an alkaline pH reduces the release of oxygen supporting the growth of anaerobic bacteria. For more information on the impact of pH on wound healing and biofilm formation, refer to this recent and thorough review.57 Increased wound pH has major implications for delayed wound healing, and the next section will focus on bacterial therapies that target this problem in chronic wound infections. Physicians face many challenges in the management of nonhealing chronic wounds including disrupting bacterial biofilms, the global rise in antibiotic resistance, excessive inflammation, and an alkaline wound environment. Thus, the ideal therapy for wound infections is one that can reduce wound pH, dampen the immune response and target the bacterial infection. One promising and relatively unexplored treatment that meets these criteria is the use of probiotic therapy. Utilizing commensal probiotics has shown promise in preventing and treating gut, oral, and urinary tract bacterial infections.58 As probiotics are typically bacteria that reside in the gut, they prefer an acidic environment and grow best in pH 3–5. It has been proposed that, because probiotics can compete with pathogens for host tissue binding sites, stimulate the release of anti-inflammatory cytokines, lower pH, release antimicrobial compounds, and deactivate the virulence factors of bacterial pathogens, they are excellent candidates for promoting wound healing in diabetic foot ulcers.59 The following section will focus on probiotic studies conducted in vitro and in vivo. In 2010, Ramos et al64 provided some of the strongest evidence for the utilization of probiotics in the destruction of P. aeruginosa biofilms in vitro. The authors reported that acidic filtrates prepared from Lactobacillus plantarum supernatants disrupted biofilms made by a laboratory strain of P. aeruginosa by 43% and a P. aeruginosa clinical strain isolated from a wound by 35%.64 Ramos et al65 went on to use L. plantarum supernatants to both disperse and inhibit P. aeruginosa biofilms, and indirectly reduce the production of numerous virulence factors (elastase, pyocyanin, rhamnolipids).65 Overall, these studies provide the groundwork for understanding the antibiofilm properties of probiotics. However, there remain many questions as to the antimicrobial efficacy of probiotics against wound pathogens and multispecies biofilms. Another mechanism by which probiotics have been shown to enhance wound healing is by protecting the host from pathogens like S. aureus and dampening the immune response. For example, the probiotic strains Lactobacillus reuteri and Lactobacillus rhamnosus were shown to protect human keratinocytes from S. aureus-induced cell death when applied prior to or concurrently with S. aureus. However, if S. aureus cells were incubated with keratinocytes for as little as 1 hour, the addition of Lactobacillus spp. did not provide any protection to the host skin cells.66 In another recent study, when L. rhamnosus was simultaneously incubated with S. aureus and PMNs (murine and human), there was a reduction in S. aureus-associated PMN death and NET formation.67 As ROS production is essential to NET formation, the authors next tested if pretreating PMNs with L. rhamnosus could prevent ROS production. L. rhamnosus incubation resulted in decreased ROS production when PMNs were activated with phorbol 12-myristate 13-acetate or H2O2. Some of the probiotic strains tested were able to activate NETosis alone, so this anti-inflammatory effect is clearly species specific.67 L. plantarum supernatants were similarly shown to protect human PMNs from P. aeruginosa-associated apoptosis/necrosis via the destruction of P. aeruginosa quorum-sensing molecules.68 By disrupting pathogenic biofilms and protecting key cells in the wound environment, probiotics have clearly demonstrated efficacy to provide crucial support to wound healing in vitro. Another probiotic application was based on the idea that Lactobacillus fermentum plus glucose produces nitrate and protons leading to nitric oxide gas (gNO) production, which can lower pH, promote healing, and kill S. aureus. This concept was tested in a rabbit full thickness wound infection model.72 One day after the wounds were infected with S. aureus, they were treated for 21 days with an adherent patch containing lactic acid bacteria that produced gNO. The authors observed that wounds treated with the gNO patch were 2.52 times more likely to close and displayed modest histological improvements, as compared to wounds treated with control patches. While some of the work performed in animal models is encouraging, as of yet, there have been no studies treating pre-established in vivo biofilms with topical probiotic therapeutics. Clearly there is much work to be done in this field, examining different pathogens, various probiotic strains, and optimizing treatment strategies. While mechanistic studies examining the use of topical probiotics on wounds in animal models is lacking, there have been some very thorough and informative clinical studies. For example, a study conducted in Argentina evaluated the use of topical L. plantarum cultures to treat infected second-degree and noninfected third-degree burns.73 The probiotic therapy was compared to silver sulfadiazine for the treatment of 80 total burn wounds (38 L. plantarum treatments versus 42 silver sulfadiazine treatments), and the markers of clinical effectiveness measured were bacterial load and wound healing rates. L. plantarum cultures were applied directly to the wounds for 10 days, and the patients receiving the probiotic topical therapy did not receive any other form of antimicrobial treatment. The other group of patients received a daily antiseptic bath with 0.5% chlorhexidine and treatment with silver sulfadiazine cream daily for 10 days. While there were no significant differences in bacterial load or healing rates observed between the groups, there were also no cases of sepsis in either treatment group, suggesting that L. plantarum can be safely used in humans and function similarly to the antimicrobial standard of care treatments for slow-healing burn wound infections.73 Another study was performed by the same research group examining the impact of topical L. plantarum cultures on 14 diabetic ulcers and 20 nondiabetic ulcers.74 Although no difference was observed between groups, treatment with topical L. plantarum reduced the numbers of bacteria, neutrophils, apoptotic/necrotic cells, and promoted wound healing. The most recent clinical probiotic wound study was also conducted by Valdez et al and reported in a 2013 book chapter.75 In this study, type 2 diabetics with foot ulcers were treated with topical L. plantarum cultures (number [n] =20) or with standard debridement (n=10) over the course of 30 days, and then the patients were followed for 20 days post-treatment. The investigators reported that treating the diabetic foot ulcers with L. plantarum doubled the rates of wound healing, granulation, and bacterial load reduction.75 Overall, these clinical studies provide a great deal of optimism for the utilization of probiotic therapy in wound care management. While much optimization and evaluation remain to be done, the studies conducted thus far provide an excellent foundation for the clinical proof of principle for this therapy. Throughout this review, we have discussed biofilms, the bacterial pathophysiology of wounds, probiotics, and wound healing, but how does this information translate to the clinic? One of the main translational concepts presented was the importance of pH in wound healing (Figure 2). The measurement of wound pH is an easy and important, but often overlooked, indicator of nonhealing wounds. Nonhealing wounds typically have a pH that is neutral to slightly alkaline,57 and from the experimental evidence, it appears that attempts should be made to reduce pH and shift the wound toward an acidic environment. This was found to be especially true when the pH of 30 burn wounds was measured following a second dressing change.76 Those wounds that went on to heal had a mean pH of 7.32, while the mean pH was 7.73 in nonhealing wounds that required skin grafting. This review also covered the use of probiotics to lower wound pH, which theoretically will lead to decreased biofilm formation and persistence of pathogens,57 reduced apoptosis67,68 and migration of PMNs,57 and will ultimately shift wounds toward the healing spectrum. However, there are some concerns with the use of probiotics to treat wounds, specifically concerning septicemia caused by the topical application of Lactobacillus spp. Although there were no reports of septicemia in the clinical wound studies that used L. plantarum topically,73–75 Lactobacillus septicemia is possible in severely immunocompromised individuals, and seems to be strain specific. Two retrospective studies comprising a total of 260 cases of Lactobacillus septicemia noted that the top causative strain was L. rhamnosus.77,78 Thus, there is a clear need for investigators to conduct future probiotic studies to carefully consider published data before choosing their probiotic strains and study parameters. While debridement is essential in managing nonhealing wounds, it should also be noted that any form of debridement seems to immediately shift the wound toward an alkaline pH (Figure 2) due to the increased perfusion of blood components into the wound site.54 In addition, medicinal maggots used for debridement release ammonium bicarbonate as a byproduct, which potentially shifts the wound environment toward alkalinity.57 Though maggot debridement therapy is reported to be an effective wound therapeutic, there remains a clear gap on the impact of this therapy on wound pH. Overall, there is a therapeutic window for the application of the aforementioned acidic agents following debridement to promote wound healing. The efficacy of enzymatic debridement and antibiotics are also closely tied to wound pH. For instance, enzymatic debridement agents like papain have a pH range of 3–12 (optimum pH: 7), while collagenase has an optimum pH range of 6–8 (Figure 2), but fibrinolysis used in conjunction with DNase only has pH activity ranging from 4.5 to 5.5.54 Additionally, the impact of pH on new fluoroquinolones has recently been explored and it appears that acidic pH environments enhance the antimicrobial activity of delafloxacin80 and finafloxacin81 against S. aureus, but acidic environments decrease the antimicrobial activity of monofloxacin81 and ciprofloxacin.80 Thus, the optimal pH for different enzymatic and antibiotic agents needs to be carefully considered before applying these treatments to wounds. Finally, wound pH also appears to be an important factor influencing grafting success. 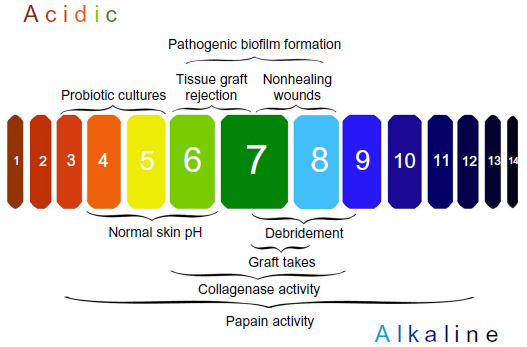 Several studies of burn and chronic wounds have noted that tissue rejection is more likely when wounds are acidic,54,76 and the more alkaline the wound, the better the likelihood that the skin graft will take (Figure 2).82 For example, in 18 different wounds requiring grafts, patients with a wound pH below 7.4 experienced 0% graft acceptance, while those above this cutoff experienced 99% graft acceptance.56 Thus, acidic pH in the wound is not always beneficial and must be adjusted and evaluated properly based on the required therapy. Chronic wounds persist for a variety of reasons, but the role of bacterial biofilms in preventing healing seems very clear. The continuous presence of biofilms results in a chronic state of inflammation in the wound. Collateral tissue damage occurs as the immune system tries to remove the biofilm, and this often increases bacterial pathogenesis by stimulating growth, spread, or even invasion of the pathogen. Pathogens in a wound can contribute to increased wound pH, cause neutrophil destruction, reduce macrophage infiltration, and decrease oxygen tension, all of which contribute to delayed wound healing. Manipulating the microbial ecology of wounds with probiotics appears to be a promising and cost-effective therapy with the potential to lower wound pH, increase oxygen tension, reduce inflammation, and prevent or disrupt infection by pathogens. Wound infection research in the Kendra P Rumbaugh laboratory is supported by grants from the National Institute of Allergy and Infectious Diseases (AI105763 and AI107570) and the US Army Research Office (grant 62507-LS). This review was supported in part by an appointment to the Postgraduate Research Participation Program administered by the Oak Ridge Institute for Science and Education. Special thanks to Katie Farris for her technical and artistic contributions to the review figures. Hay RJ, Johns NE, Williams HC, et al. The global burden of skin disease in 2010: an analysis of the prevalence and impact of skin conditions. J Invest Dermatol. 2014;134(6):1527–1534. Kim PJ, Evans KK, Steinberg JS, Pollard ME, Attinger CE. Critical elements to building an effective wound care center. J Vasc Surg. 2013;57(6):1703–1709. Sun BK, Siprashvili Z, Khavari PA. Advances in skin grafting and treatment of cutaneous wounds. Science. 2014;346(6212):941–945. Supp DM, Boyce ST. Engineered skin substitutes: practices and potentials. Clin Dermatol. 2005;23(4):403–412. Cowan LJ, Stechmiller JK, Phillips P, Yang Q, Schultz G. Chronic wounds, biofilms and use of medicinal larvae. Ulcers. 2013;2013:487024. Schultz GS, Sibbald RG, Falanga V, et al. Wound bed preparation: a systematic approach to wound management. Wound Repair Regen. 2003;11 Suppl 1:S1–S28. Fogerty MD, Abumrad NN, Nanney L, Arbogast PG, Poulose B, Barbul A. Risk factors for pressure ulcers in acute care hospitals. Wound Repair Regen. 2008;16(1):11–18. Greenhalgh DG. Skin, soft tissue, and wound healing in the elderly. In: Yelon JA, Luchette FA, editors. Geriatric Trauma and Critical Care. New York, NY: Springer; 2014:37–44. Demidova-Rice TN, Hamblin MR, Herman IM. Acute and impaired wound healing: pathophysiology and current methods for drug delivery, part 1: normal and chronic wounds: biology, causes, and approaches to care. Adv Skin Wound Care. 2012;25(7):304–314. O’Donnell TF Jr, Passman MA, Marston WA, et al; Society for Vascular Surgery; American Venous Forum. Management of venous leg ulcers: clinical practice guidelines of the Society for Vascular Surgery ® and the American Venous Forum. J Vasc Surg. 2014;60(2 Suppl):3S–59S. Percival SL, Hill KE, Williams DW, Hooper SJ, Thomas DW, Costerton JW. A review of the scientific evidence for biofilms in wounds. Wound Repair Regen. 2012;20(5):647–657. Vuotto C, Donelli G. Anaerobes in biofilm-based healthcare-associated infections. Adv Exp Med Biol. 2015;830:97–112. Kirketerp-Møller K, Zulkowski K, James G. Chronic wound colonization, infection, and biofilms. In: Høiby N, Jensen PØ, Moser C, Høiby N, editors. Biofilm Infections. New York: Springer; 2011:11–24. Metcalf DG, Bowler PG. Clinician perceptions of wound biofilm. Int Wound J. Epub September 8, 2014. Leake JL, Dowd SE, Wolcott RD, Zischkau AM. Identification of yeast in chronic wounds using new pathogen-detection technologies. J Wound Care. 2009;18(3):103–104, 106, 108. Thompson MG, Black CC, Pavlicek RL, et al. Validation of a novel murine wound model of Acinetobacter baumannii infection. Antimicrob Agents Chemother. 2014;58(3):1332–1342. Kong HH, Segre JA. Skin microbiome: looking back to move forward. J Invest Dermatol. 2012;132(3 Pt 2):933–939. Taneja N, Chari P, Singh M, Singh G, Biswal M, Sharma M. Evolution of bacterial flora in burn wounds: key role of environmental disinfection in control of infection. Int J Burns Trauma. 2013;3(2):102–107. Dowd SE, Sun Y, Secor PR, et al. Survey of bacterial diversity in chronic wounds using pyrosequencing, DGGE, and full ribosome shotgun sequencing. BMC Microbiol. 2008;8:43. Wolcott RD, Rhoads DD, Dowd SE. Biofilms and chronic wound inflammation. J Wound Care. 2008;17(8):333–341. Freudenberg MA, Tchaptchet S, Keck S, et al. Lipopolysaccharide sensing an important factor in the innate immune response to Gram-negative bacterial infections: benefits and hazards of LPS hypersensitivity. Immunobiology. 2008;213(3–4):193–203. Davis P. The immunology of wound healing: the body as a battlefield. Wounds UK. 2008;4(4):54–69. Fioredda F, Calvillo M, Bonanomi S, et al; Neutropenia Committee of the Marrow Failure Syndrome Group of the AIEOP (Associazione Italiana Emato-Oncologia Pediatrica). Congenital and acquired neutropenias consensus guidelines on therapy and follow-up in childhood from the Neutropenia Committee of the Marrow Failure Syndrome Group of the AIEOP (Associazione Italiana Emato-Oncologia Pediatrica). Am J Hematol. 2012;87(2):238–243. Schultz GS, Ladwig G, Wysocki A. Extracellular matrix: review of its roles in acute and chronic wounds. World Wide Wounds. 2005. Ozinsky A, Underhill DM, Fontenot JD, et al. The repertoire for pattern recognition of pathogens by the innate immune system is defined by cooperation between toll-like receptors. Proc Natl Acad Sci U S A. 2000;97(25):13766–13771. El Kebir D, József L, Filep JG. Neutrophil recognition of bacterial DNA and Toll-like receptor 9-dependent and -independent regulation of neutrophil function. Arch Immunol Ther Exp (Warsz). 2008;56(1):41–53. Kaplan MJ, Radic M. Neutrophil extracellular traps: double-edged swords of innate immunity. J Immunol. 2012;189(6):2689–2695. Hänsch GM. Host defence against bacterial biofilms: “mission impossible”? ISRN Immunology. 2012;2012:853123. Jensen PØ, Givskov M, Bjarnsholt T, Moser C. The immune system vs Pseudomonas aeruginosa biofilms. FEMS Immunol Med Microbiol. 2010;59(3):292–305. Mulcahy LR, Isabella VM, Lewis K. Pseudomonas aeruginosa biofilms in disease. Microb Ecol. 2014;68(1):1–12. Xavier JB, Kim W, Foster KR. A molecular mechanism that stabilizes cooperative secretions in Pseudomonas aeruginosa. Mol Microbiol. 2011;79(1):166–179. Abdel-Mawgoud AM, Lépine F, Déziel E. Rhamnolipids: diversity of structures, microbial origins and roles. Appl Microbiol Biotechnol. 2010;86(5):1323–1336. Jensen PØ, Bjarnsholt T, Phipps R, et al. Rapid necrotic killing of polymorphonuclear leukocytes is caused by quorum-sensing-controlled production of rhamnolipid by Pseudomonas aeruginosa. Microbiology. 2007;153(Pt 5):1329–1338. van Gennip M, Christensen LD, Alhede M, et al. Interactions between polymorphonuclear leukocytes and Pseudomonas aeruginosa biofilms on silicone implants in vivo. Infect Immun. 2012;80(8):2601–2607. Walker TS, Tomlin KL, Worthen GS, et al. 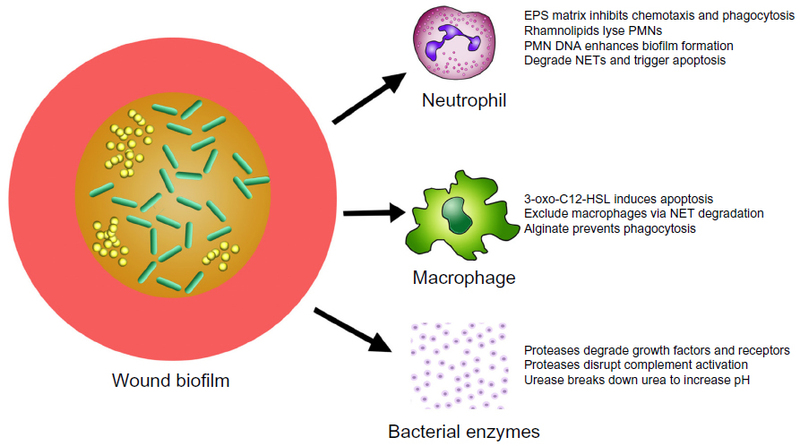 Enhanced Pseudomonas aeruginosa biofilm development mediated by human neutrophils. Infect Immun. 2005;73(6):3693–3701. Watters C, Everett JA, Haley C, Clinton A, Rumbaugh KP. Insulin treatment modulates the host immune system to enhance Pseudomonas aeruginosa wound biofilms. Infect Immun. 2014;82(1):92–100. Nguyen KT, Seth AK, Hong SJ, et al. Deficient cytokine expression and neutrophil oxidative burst contribute to impaired cutaneous wound healing in diabetic, biofilm-containing chronic wounds. Wound Repair Regen. 2013;21(6):833–841. Young RL, Malcolm KC, Kret JE, et al. Neutrophil extracellular trap (NET)-mediated killing of Pseudomonas aeruginosa: evidence of acquired resistance within the CF airway, independent of CFTR. PLoS One. 2011;6(9):e23637. Khanna S, Biswas S, Shang Y, et al. Macrophage dysfunction impairs resolution of inflammation in the wounds of diabetic mice. PLoS One. 2010;5(3):e9539. Tateda K, Ishii Y, Horikawa M, et al. The Pseudomonas aeruginosa autoinducer N-3-oxododecanoyl homoserine lactone accelerates apoptosis in macrophages and neutrophils. Infect Immun. 2003;71(10):5785–5793. Vikström E, Magnusson KE, Pivoriūnas A. The Pseudomonas aeruginosa quorum-sensing molecule N-(3-oxododecanoyl)-L-homoserine lactone stimulates phagocytic activity in human macrophages through the p38 MAPK pathway. Microbes Infect. 2005;7(15):1512–1518. Leid JG, Willson CJ, Shirtliff ME, Hassett DJ, Parsek MR, Jeffers AK. The exopolysaccharide alginate protects Pseudomonas aeruginosa biofilm bacteria from IFN-gamma-mediated macrophage killing. J Immunol. 2005;175(11):7512–7518. McCarty SM, Cochrane CA, Clegg PD, Percival SL. The role of endogenous and exogenous enzymes in chronic wounds: a focus on the implications of aberrant levels of both host and bacterial proteases in wound healing. Wound Repair Regen. 2012;20(2):125–136. Supuran CT, Scozzafava A, Mastrolorenzo A. Bacterial proteases: current therapeutic use and future prospects for the development of new antibiotics. Expert Opin Ther Pat. 2001;11(2):221–259. Gupta R, Beg QK, Lorenz P. Bacterial alkaline proteases: molecular approaches and industrial applications. Appl Microbiol Biotechnol. 2002;59(1):15–32. Schultz GS, Wysocki A. Interactions between extracellular matrix and growth factors in wound healing. Wound Repair Regen. 2009;17(2):153–162. Laarman AJ, Bardoel BW, Ruyken M, et al. Pseudomonas aeruginosa alkaline protease blocks complement activation via the classical and lectin pathways. J Immunol. 2012;188(1):386–393. Kuang Z, Hao Y, Walling BE, Jeffries JL, Ohman DE, Lau GW. Pseudomonas aeruginosa elastase provides an escape from phagocytosis by degrading the pulmonary surfactant protein-A. PLoS One. 2011;6(11):e27091. Schneider LA, Korber A, Grabbe S, Dissemond J. Influence of pH on wound-healing: a new perspective for wound-therapy? Arch Dermatol Res. 2007;298(9):413–420. Roberts G, Chuley A, Mani R. The world milieu in venous ulcers – further observations. Presented at the European Wound Management Association Conference. Stuttgart, Germany; 2005. Shukla VK, Shukla D, Tiwary SK, Agrawal S, Rastogi A. Evaluation of pH measurement as a method of wound assessment. J Wound Care. 2007;16(7):291–294. Percival SL, McCarty S, Hunt JA, Woods EJ. The effects of pH on wound healing, biofilms, and antimicrobial efficacy. Wound Repair Regen. 2014;22(2):174–186. Hickson M. Examining the evidence for the use of probiotics in clinical practice. Nurs Stand. 2013;27(29):35–41. Sonal Sekhar M, Unnikrishnan MK, Vijayanarayana K, Rodrigues GS, Mukhopadhyay C. Topical application/formulation of probiotics: will it be a novel treatment approach for diabetic foot ulcer? Med Hypotheses. 2014;82(1):86–88. Karska-Wysocki B, Bazo M, Smoragiewicz W. Antibacterial activity of Lactobacillus acidophilus and Lactobacillus casei against methicillin-resistant Staphylococcus aureus (MRSA). Microbiol Res. 2010;165(8):674–686. Tejero-Sariñena S, Barlow J, Costabile A, Gibson GR, Rowland I. In vitro evaluation of the antimicrobial activity of a range of probiotics against pathogens: evidence for the effects of organic acids. Anaerobe. 2012;18(5):530–538. Wang Y, Dai A, Huang S, et al. Propionic acid and its esterified derivative suppress the growth of methicillin-resistant Staphylococcus aureus USA300. Benef Microbes. 2014;5(2):161–168. Sikorska H, Smoragiewicz W. Role of probiotics in the prevention and treatment of meticillin-resistant Staphylococcus aureus infections. Int J Antimicrob Agents. 2013;42(6):475–481. Ramos AN, Peral MC, Valdez JC. Differences between Pseudomonas aeruginosa in a clinical sample and in a colony isolated from it: comparison of virulence capacity and susceptibility of biofilm to inhibitors. Comp Immunol Microbiol Infect Dis. 2010;33(3):267–275. Ramos AN, Cabral ME, Noseda D, Bosch A, Yantorno OM, Valdez JC. Antipathogenic properties of Lactobacillus plantarum on Pseudomonas aeruginosa: the potential use of its supernatants in the treatment of infected chronic wounds. Wound Repair Regen. 2012;20(4):552–562. Prince T, McBain AJ, O’Neill CA. Lactobacillus reuteri protects epidermal keratinocytes from Staphylococcus aureus-induced cell death by competitive exclusion. Appl Environ Microbiol. 2012;78(15):5119–5126. Vong L, Lorentz RJ, Assa A, Glogauer M, Sherman PM. Probiotic Lactobacillus rhamnosus inhibits the formation of neutrophil extracellular traps. J Immunol. 2014;192(4):1870–1877. Ramos AN, Gobbato N, Rachid M, González L, Yantorno O, Valdez JC. Effect of Lactobacillus plantarum and Pseudomonas aeruginosa culture supernatants on polymorphonuclear damage and inflammatory response. Int Immunopharmacol. 2010;10(2):247–251. Jabbar H, Al-Mathkhury F, Jabbar H, Al-Aubeidi AR. Probiotic effect of Lactobacilli on mice incisional wound infections. Journal of Al-Nahrain University. 2008;11(3):111–116. Shu M, Wang Y, Yu J, et al. Fermentation of Propionibacterium acnes, a commensal bacterium in the human skin microbiome, as skin probiotics against methicillin-resistant Staphylococcus aureus. PLoS One. 2013;8(2):e55380. Zahedi F, Heydari Nasrabadi M, Tajabadi Ebrahimi M, Aboutalebi H. Comparison of the effects of Lactobacillus brevis and Lactobacillus plantarum on cutaneous wound healing in rats. African Journal of Microbiology Research. 2011;5(24):4226–4233. Jones M, Ganopolsky JG, Labbé A, et al. Novel nitric oxide producing probiotic wound healing patch: preparation and in vivo analysis in a New Zealand white rabbit model of ischaemic and infected wounds. Int Wound J. 2012;9(3):330–343. Peral MC, Martinez MA, Valdez JC. Bacteriotherapy with Lactobacillus plantarum in burns. Int Wound J. 2009;6(1):73–81. Peral MC, Rachid MM, Gobbato NM, Huaman Martinez MA, Valdez JC. Interleukin-8 production by polymorphonuclear leukocytes from patients with chronic infected leg ulcers treated with Lactobacillus plantarum. Clin Microbiol Infect. 2010;16(3):281–286. Valdez C, Ramos A, Fernadnez D, et al. Probiotics and their potential use in wound healing. In: Kitazawa H, Villena J, Alvarez S, editors. Probiotics: Immunobiotics and Immunogenics. Hoboken, NJ: Taylor & Francis; 2013:298–335. Sharpe JR, Booth S, Jubin K, Jordan NR, Lawrence-Watt DJ, Dheansa BS. Progression of wound pH during the course of healing in burns. J Burn Care Res. 2013;34(3):e201–e208. Cannon JP, Lee TA, Bolanos JT, Danziger LH. Pathogenic relevance of Lactobacillus: a retrospective review of over 200 cases. Eur J Clin Microbiol Infect Dis. 2005;24(1):31–40. Gouriet F, Million M, Henri M, Fournier PE, Raoult D. Lactobacillus rhamnosus bacteremia: an emerging clinical entity. Eur J Clin Microbiol Infect Dis. 2012;31(9):2469–2480. Prabhu V, Prasadi S, Pawar V, Shivani A, Gore A. Does wound pH modulation with 3% citric acid solution dressing help in wound healing: a pilot study. Saudi Surgical Journal. 2014;2(2):38–46. Lemaire S, Tulkens PM, Van Bambeke F. Contrasting effects of acidic pH on the extracellular and intracellular activities of the anti-gram-positive fluoroquinolones moxifloxacin and delafloxacin against Staphylococcus aureus. Antimicrob Agents Chemother. 2011;55(2):649–658. Lemaire S, Van Bambeke F, Tulkens PM. Activity of finafloxacin, a novel fluoroquinolone with increased activity at acid pH, towards extracellular and intracellular Staphylococcus aureus, Listeria monocytogenes and Legionella pneumophila. Int J Antimicrob Agents. 2011;38(1):52–59. Sharpe JR, Harris KL, Jubin K, Bainbridge NJ, Jordan NR. The effect of pH in modulating skin cell behaviour. Br J Dermatol. 2009;161(3):671–673.